I’ve never been a fan of germs. I tend to wash my hands often and am a bit of a germophobe. However I have always enjoyed the outdoors and actually love gardening. Digging in the dirt with my hands. I’m not a fan of the bugs I come across in the dirt, but the dirt and the plants I like. I guess to some extent I have always been more of a girly-girl than a tom-boy (two extremes) and never really liked getting dirty or muddy. Having two boys, however, has taught me to let loose and get a little dirty. This past spring we took it a step further and signed our 3 year old up for a Tinkergarten class. This was a big step for us. I had noticed that my son was very hesitant to get dirty or muddy. He wouldn’t put his hands in the dirt or sand. He wouldn’t run and splash in the puddles or tromp through the mud. I decided it was time to change this now while he was still young. I also wanted to teach my 1 year old to also be comfortable playing outside. We found splash jackets, splash pants, and rain boots at Hatley for the boys and I got a fabulous pair of rain boots from LLBean. We signed up for a once a week Tinkergarten class and joined other little ones with their parents at a local park. These classes are outdoor classrooms. They meet at a local park with a “leader”, the “explorers” (kids), and their “guides” (parents). The explorers are encouraged to go and search for “nature treasures” and then guided to discuss them, show them, categorize them, etc. Watching my son try to find nature treasures and then get his hands dirty picking them and putting them in his bucket was eye opening. He was hesitant to get his hands dirty. He would ask me to do it instead, but I gently encouraged him to do it himself. The class continues with the group coming together for a song and introductions as well as a instructions for the day’s activity. Then sent off again, the explorers head out to work on their activity. One day we “baked” with mud, dirt, leaves, flowers, twigs, etc to make the earth a birthday party. Another day we explored the concept of camouflage. We made houses for the animals and fairies. We explored weight and pulleys. We even made bubble wands with sticks. Everything was done with things found in nature (in addition to a few pipe cleaners, yarn, rope, buckets). The best part? 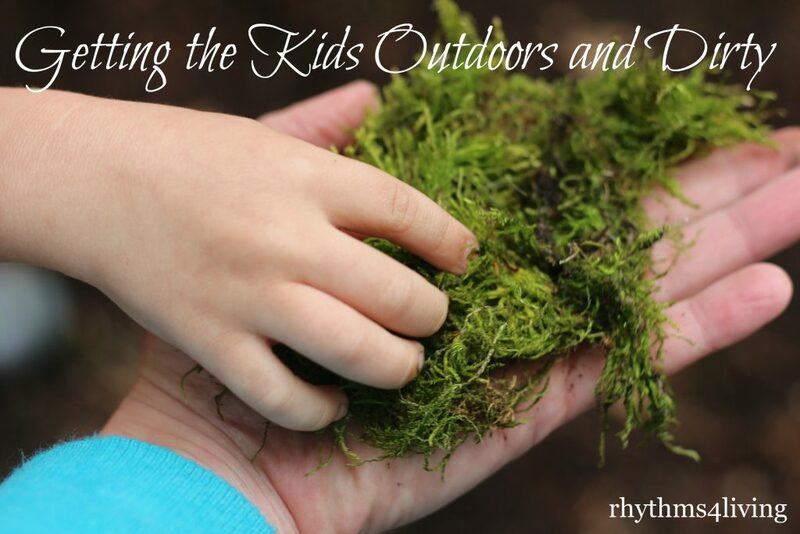 The kids were outside the whole time, in the sun or rain, in the dirt or mud, in the grass, touching, feeling, breathing, seeing all of the natural world around them. And now my kids LOVE being outside, playing in the dirt, exploring and learning. I love watching them play and learn and I love the calm and peace I feel when being outside with them. When we are outside everything is calm yet energizing. There isn’t chaos or flickering lights or overstimulating noises and sights (which often comes from TV and computers and malls). We can just breathe the fresh air, hear the wind and the songs of the birds, and feel the earth below our feet. I recently read an article about how good dirt is for us, especially for our kids as they are developing their immune system. Check it out here. 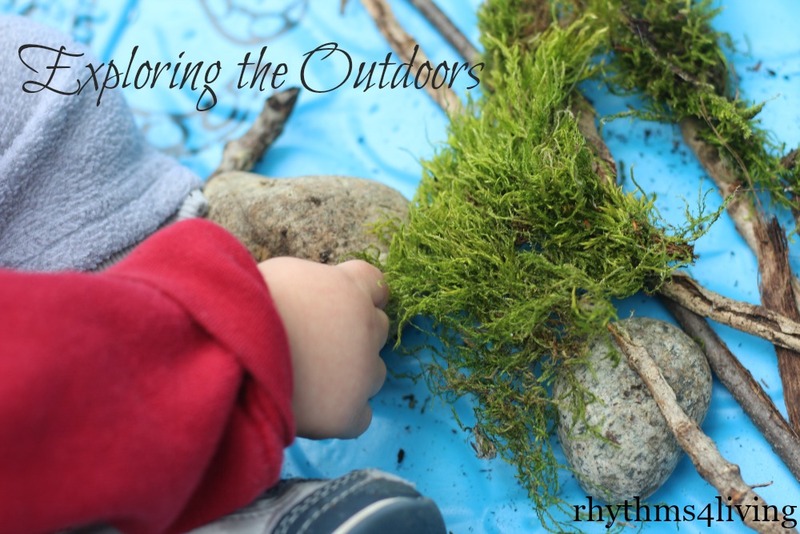 We have made outside play a part of our daily lives. It refreshes us. It gives the boys a chance to explore and learn. Its good for our immune system and for our mental health. It is play, learning, self care, and bonding time for our family. I encourage you to experience the benefits of outdoor play as well! Share with us your favorite outdoor activities in the comments! A wealth of down 2 earth ideas, encouragement, and adventure. Wonderful ideas to raise children and improve family life. Thank you and keep them coming! Blessings! I love the idea of Tinkergarden! I also feel calmer & energized outside. It’s good to know it’s great for our immune system & mental health also! Hello Mrs. Kristen, I am Juan Gomez mom, we met about 5 years back when you tought my son Music therapy. I am so happy to read that your familiy has grown and that you love outdoor play, Juan and I love outdoor play but specially we like the beach he is fascinated by the sand and water. Lors of love from my family to yours I am very gratefull. So great to hear from you! We love the beach as well, although the beaches here are very different from the Florida beaches. I imagine Juan spends hours exploring and creating in the sand and water. Our boys can keep themselves occupied for a long time at the beach – one of our favorite outdoor play areas!